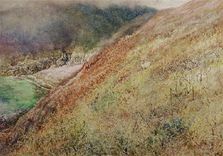 This watercolour by Caparne illustrates his skill at rendering the various textures and tones present around the Guernsey coastline. We get a real sense of the difference between the feel of the spiky forms of the Sea Radish in the foreground to the translucence of the sea below. Also beautifully described are the subtle differences present in the landscape. The defined rocks close to the sandy shore are in contrast to the cliffs above, which have been veiled by the sea fog rolling in above the bay.